Using radio-frequency identification (RFID) technology, the Passport™ reads the unique ID of the Passport Key™ worn on your dog's collar and locks or unlocks based on settings for that dog. 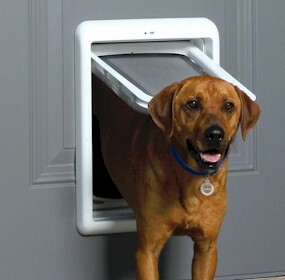 This allows access to only your programmed dog(s) while keeping out other pets, wild animals, and strays. Offering selective entry and exit by dog, multiple access options (such as in-only access and out-only access) and the option to only allow access at specific times of day, the Passport™ gives you complete control of each dog's access. Programming is easy using the LCD screen and 5-star navigation or by connecting to your computer with the included USB cable. 5 meter extension lead for the PetPorte cat flap. Use this lead to extend the cable (2.5m) that is included with the PetPorte Microchip Cat Flap. This will give you a total length of 7.5m ..